I didn’t want one. I fought the possibility of owning one. I was eventually talked into getting one. This is an ode to my Kindle. I have read over 150 books since getting to Thailand and the majority of them were on my Kindle. It currently holds over 100 unread books. If it wasn’t for my Kindle, not only would I have not read so many books, but I wouldn’t be able to check box scores on days I don’t go into the office. Although very slow, it can get simple web pages. I didn’t want a Kindle because I love the physical form of a novel. I like walking by strangers and seeing what they’re reading. I want to know if the cute woman in the coffee shop is reading Slaughterhouse Five or Fifty Shades of Grey. There’s a big difference. I also don’t like paying large amounts for new books. With exception to gifts, almost every book I’ve purchased in my adult life has been used (the one exception being Joe Torre’s memoir The Yankee Years; I couldn’t resist.) The books I read in the states were from the library, used or borrowed. I read bestsellers, but months after they’ve dropped off the list. As for the library, rarely is there a place I’d rather be on an off day in Eau Claire. It was a great place to be with a vast variety of literature and free Wi-Fi. If it didn’t have the book I wanted, I could order it from any library in Western Wisconsin. Crossroads Books on Farwell Street in downtown Eau Claire is a great used book store. The Half-Priced Books in the Twin Cities were even better. In every city I visit when traveling in the United States I’d seek out the used-book stores and see what they had to offer. So why would I need a Kindle? I pay, at most, $7 for every book I’ve read in the last decade and had a fantastic library a 15-minute walk from my place. I needed a Kindle because none of this is available in rural Thailand. Sure, there’s a huge library of give-and-take books at the Peace Corps lounge in Bangkok, but I’m not there very often and the vast majority of books are paperbacks of the Grisham and Patterson type – not my cup of tea. I have received gift certificates from friends and family to Amazon in order to keep this bibliophile satisfied. Thankfully I was able to “borrow” a few (thousand) Kindle books from friends over here and can honestly say I have enough to last me through March. I also managed to find 10 used books in Chiang Mai last month, many of them long history books that will last me more than three days each. When a good-sized novel would take me about a week in the states, it takes three days here. Small novels are easily gobbled up in a day and 600 pagers are consumed in five days. 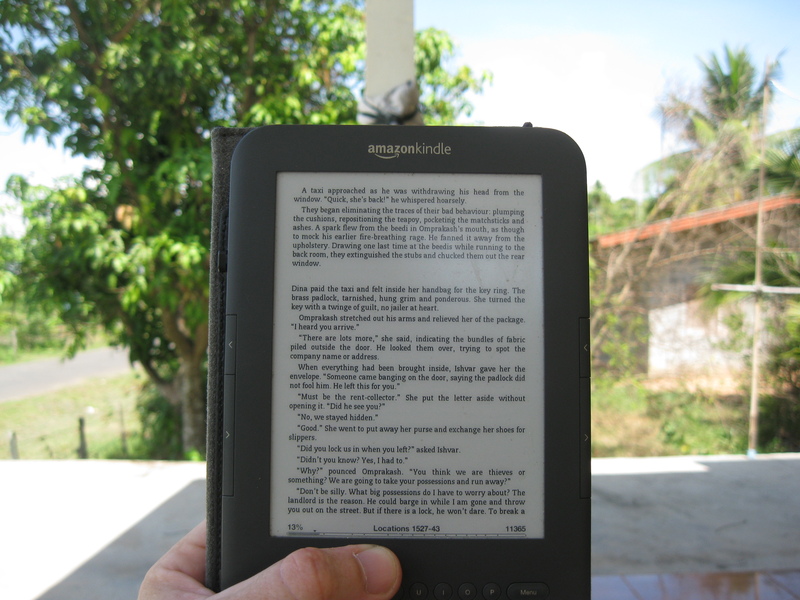 If it wasn’t for the Kindle … I don’t even want to think about it. This entry was posted in Peace Corps and tagged books, ebooks, Kindle, peace corps, thailand by Jeff Jackson. Bookmark the permalink. What happened? I loved Crossroads. I have (had) $37 credit there. That is sad. I loved that place too! The people were awesome. A few businesses have been closing downtown! It’s so strange. This confluence project sounds like it’s going to happen, yet places like Obsession Chocolates (they had established a cafe down by the old children’s theatre) already closed, as well as Crossroad’s, Turk’s (kinda crappy coffee place), Angelus Day Spa (moved), and Hahn’s Meat Market (okay, not downtown but downtownish-vibe anyway!). I think the economy is starting to feel it around here.